Dive Journal: After the dive at Coral Gardens, Debbie motors over to the Tunnels mooring buoy and we tie up to secure the site. This is the site she really wants us to see. The surface interval is fairly short, but it gives us a chance to warm up just a little bit after the dive. Linda is still getting chilly at the end of these 76°F dives, and the topside sun and warm breezes feel just great once we’re dry. Even so, she elects to miss this dive so that she can continue to warm up on the surface. Johnny and Debbie are once again doing PADI certification exercises in shallow waters, and so Janel and I and the rest of the divers follow Michael down to sand flats beneath the boat at about 40 feet. There are lots of garden eels peeking out! The last time I have seen these guys is in Belize, and then infrequently, so this is welcome treat. We fin over the sand flats, actually much too rapidly for my taste, reluctantly keeping up with Michael and the Michigan divers. We want to look around! We eventually come upon a groove cut in the sloping wall. The groove descends down and becomes a channel-like swim-through that emerges about 85 feet. 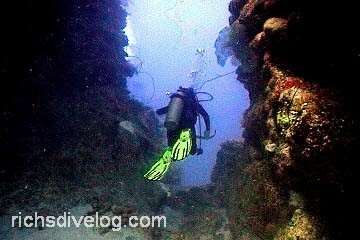 Lots of reef growth covers the side walls, which nearly form a closed tunnel above us as we swim through. There are not very many fishes here today, but lots of beautiful structures, including many varied fans and vase sponges. A few video shots included a saddle blenny and a pretty black durgeon. Following our excursion to the wall, I got some pictures of John and Debbie. John is looking pretty good in the water!